Let us celebrate Julane's life by remembering all the help and kindness she has shown to those who crossed her path. She is at the gate of Rainbow bridge taking care of PONS the way she cared for them on earth. Our heart felt prayers are going out for Julane who has been a devoted PON mom for many years. 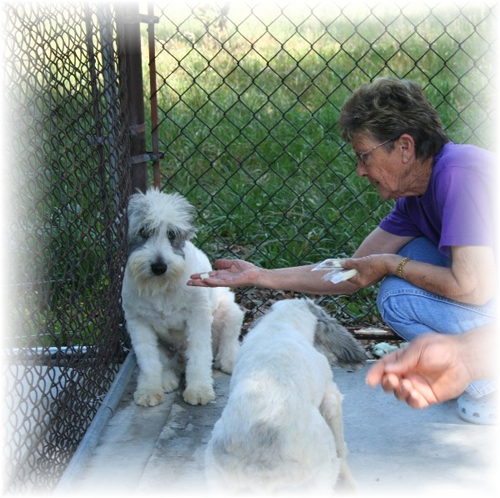 Her hard work, patience and love for those rescue Florida PONS is well known both in the USA and abroad. Without her help, it is doubtful if those PONS would have prospered and regained their health. Her work was not glamorous, but it made a significant difference which each of us appreciate and admire. Julane has always been a source of comfort and advice for many of us in the breed. She has been involved in a wide range of ways which those of us who knew her, well value. Julane never asked for anything for herself. She has always focused on the breed and helping owners care for them. We very much hope and pray that members of the PON community will come together and help Julane and her daughter in this time of crisis. Julane deserves our love and help for all the devotion she has shown our PONS through the years. She will never be forgotten. Please step up and support her family at this time in your own way. and love that doesn't pass away. but also within our hearts.